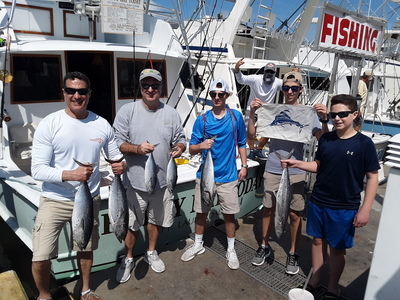 Jim Carroccia and his family chartered the Top Shot Sportfishing charter boat team for a private deep sea charter boat sport fishing trip in Fort Lauderdale, FL. We had clear skies with pretty blue waters with some scattered weed. We started trolling the reef line drop off north of Fort Lauderdale and started the trip catching bait around an anchored ship in 150 of water. We caught a hand full of Bonita using jig lures. We then started trolling up the reef line trolling over wreck and rock structures. The first bite we got was right on top of a wreck, and we caught a Kingfish. We continued trolling and got double header bites. We fought those fish and got a full grown Bonita. I continued trolling north and caught another few Bonitas. We decided to change things up and went into kite fishing. We put a kite up in the air with a couple of live baits and a bait down on the bottom. All of a sudden, I saw a black shadow underneath the live bait, and it was Sailfish. Jacob was our angler, and he started fighting the Sailfish. The Sailfish jumped out of the water, making big runs and came back up jumping again. 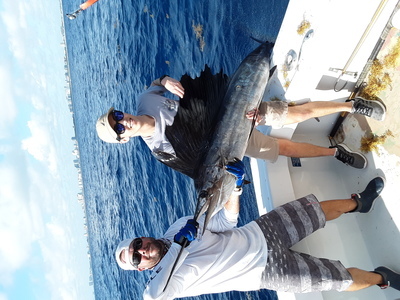 After a great fight, we got the Sailfish up to the boat, removed the hooks, got a photo and released the Sailfish. We went back to trolling and picked up another few Bonitas.